Sustainable Flying: is sustainable air travel possible? Newspaper headlines, such as: "sustainable flying, an illusion? ", are becoming increasingly common. When you read such headlines, you may even start to wonder whether sustainable or green flying is possible at all. In this article, we will attempt to gather the facts for you. e and more people are flying every day. Aviation is now responsible for 2% of all global carbon emissions (CO2). The number of air passengers is expected to double in 20 years. Sustainable flying, is it possible? Some articles report that flying green is indeed possible, while others call sustainable flying an illusion. The conclusion of most articles is that it is best to avoid flying altogether. Flying leads to lots of carbon emissions. For an average household, flying comes at number 6 of in the top 10 list of activities that cause the most carbon emissions. However, if you frequently go on distant flights, flying quickly becomes number 1 on the list. So flying is certainly not clean. Therefore, it is indeed better to avoid air travel. That said, in some cases you want or have to fly anyway. So how do you fly with the smallest environmental impact possible? How can I fly as 'sustainable' as possible? There are several tips to fly as 'sustainable' as possible. First of all, choose a flight that is as direct as possible. When you opt for connecting flights, you have to fly a greater distance. This obviously results in more carbon emissions. Furthermore, your choice of airline also makes a large difference. For example, KLM relies on biofuels for certain routes, such as the Amsterdam-Los Angeles route. Furthermore, KLM and All Nippon Airway are both in the top 3 of the Dow Jones Sustainability Index. This means that, relatively speaking, they are the least polluting airlines. Your seat choice may also save on emissions. A business class chair takes up a lot more space than an economy class chair and is therefore relatively more polluting. And finally, try to avoid flying as much as possible. If you take the train or bus, you save up to 90% in CO2 emissions. Consider booking through flight comparison sites such as FlyGRN. They offer the best price for airline tickets and offset your carbon emissions with their revenues. If you have booked elsewhere, you can still offset the CO2 emissions of your flight afterwards. There are various services for this, such as FlyGRN's compensation service. Compensating for a flight’s emissions: doing it yourself or with a service? By leading a sustainable lifestyle, you can ensure that you save a lot of CO2. However, this usually doesn’t add up if you want to compensate for the emissions of your flight. Taking environmental measures such as pulling your phone charger out of the socket, or cycling to work for a day do indeed save CO2 emissions, but that only has a tiny effect. For comparison, a single return ticket London equals nearly twenty years of keeping your charger in the wall socket. If you really want to reduce your CO2 emissions yourself, do not eat meat and try to consume as little as possible. To save for the emissions of your return flight to New York, you have to follow a vegan diet for over a year (compared to a meat diet). Since this is not always being possible, there are various services that offer carbon compensation services. These services support projects that reduce CO2 elsewhere in the world. For example, several trees are planted for several decades to compensate for the emissions of your flight. FlyGRN offers such a service. Of course, you can also choose to travel by train. For example, nowadays it is possible to travel from Amsterdam to London by train (almost) directly. This saves up to 90% of the CO2 emissions when compared with air travel. Driving is about as polluting per person as traveling by plane, unless you use every seat of your car. If you do so, you still save considerably when compared to flying. What else can I do myself to be more sustainable? In her book "The Hidden Impact", Babette Porcelijn mentions various options for reducing your environmental impact. She has produced an impact top 10. By focusing on that, you can produce large CO2 reductions. In this top 10 list, you will find suggestion such as: buy as few things as possible, eat as little meat as possible, fly as little as possible. Switching to renewable energy also pays off. What about electric flying and air travel on hydrogen? Planes are becoming more efficient every day, but the growth in efficiency of planes cannot keep up with the growth of aviation. That is why new technologies are needed. Electric flying or flying on hydrogen is often mentioned as an alternative. Flying on hydrogen is not possible for the time being, because it simply takes too much space. The first electric aircraft currently exist, but these only offer enough space for a few people and can only fly short distances. Electric flying is expected to be possible on a larger scale in the long term, but this may still take a very long time. Currently, airlines already fly on biofuels on a small scale. This saves up to 80% of carbon emissions. Yet, the disadvantage of using biofuels is that it is a few times more expensive than ordinary kerosene. Conclusion, is sustainable air travel possible? The short answer is no, sustainable air travel is not possible. It is best not to fly to be truly sustainable. The long answer is that there are certainly ways to ensure that your flight has way less of an impact. Such as the choice of airline, seat, route, and CO2 compensation. And, of course, occasionally flying a little less would not hurt either. In Europe you can travel sustainable by using the train, especially in The Netherlands since their trains are powered by green / sustainable wind energy. In the long term (within 50 years), more sustainable flying may be possible. If you're planning to fly, offset the carbon emissions of it. And book your flight via FlyGRN. They compare the cheapest flights and automatically offset your carbon emissions with their revenues. CO2 emissions 1 kWh in NL is approximately 0.5 kg. Keeping your phone plugged in on the charger and charging costs about 1 to 2 Watts * 24h * 365 = 8 to 16 kWh on average. Let's say 12 kWh. That is a CO2 emission of 6 kg per year. 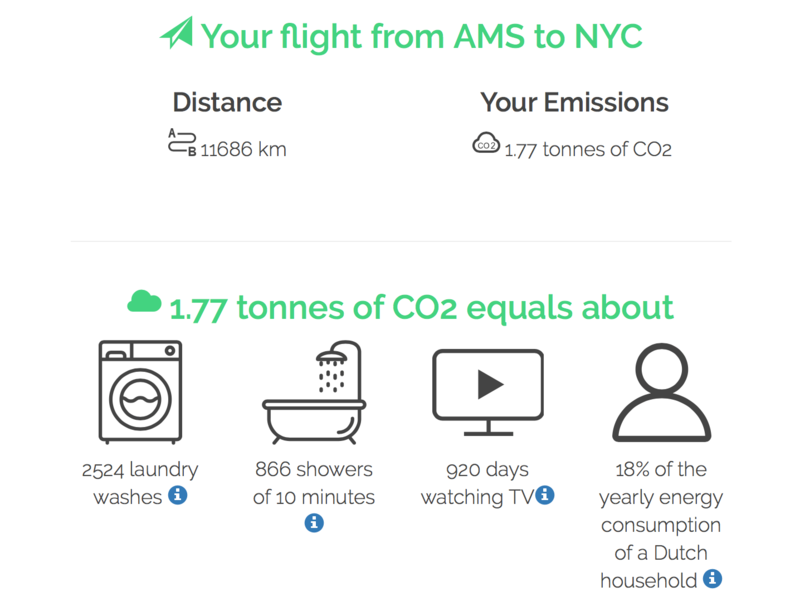 Your return ticket from Amsterdam to London emits 110 kg of CO2. So your flight to London equals nearly twenty years of keeping your charger in the wall socket.